This online tool allows for comparison of shipping traffic intensity in the Baltic Sea by ship type and date. Where are the most intense areas of shipping traffic in the Baltic Sea? What types of vessels are traveling where and when in the Baltic Sea? The tool is a part of the forthcoming HELCOM Maritime Assessment - with scheduled release in early 2017. The HELCOM AIS system, gathering and disseminating ship movement data from the entire Baltic Sea region went live in 2005 based on a decision of the HELCOM Meeting of Ministers of Transport in 2001. The regional system has generated a very large dataset but the complexity and overwhelming size of the dataset (especially if an overview of the entire Baltic Sea is attempted) is a key bottleneck in mobilising this information for users within, but also outside the maritime community, such as MSP planners. The assumption behind this tool is that many users need the possibility to explore the spatial dimensions of Baltic Sea ship traffic data to identify movement patterns of specific ship types and effects of seasonality which are interesting for their particular case. 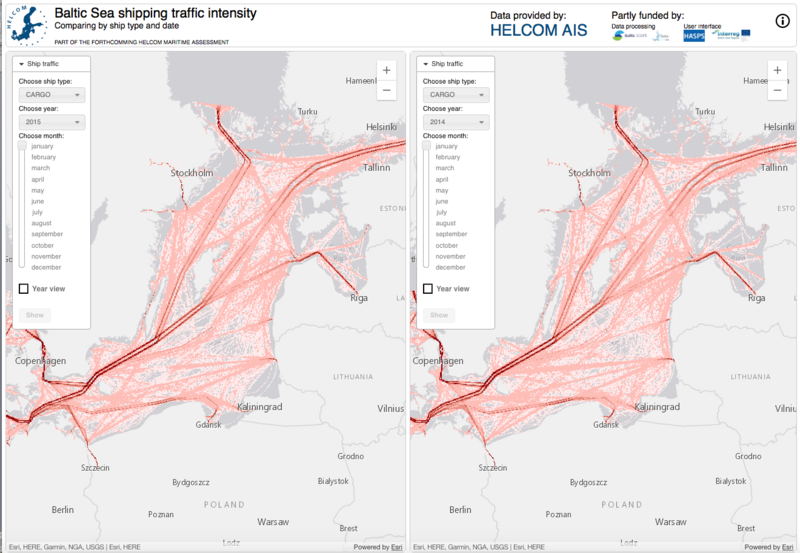 A key task of the HELCOM Secretariat within the Baltic SCOPE project was to create AIS based shipping traffic density maps for the entire Baltic Sea planning area by using all available time series – and for this purpose to create and implement a consistent and thoroughly documented methodology. Both PDF maps and GIS files in raster format were delivered. These maps, created for BalticSCOPE, can also be viewed via the online tool developed by the HELCOM Secretariat with funding from other projects. This tool provides an easily accessible tool to do such exploration based on 1x1 km grid data calculated by the HELCOM Secretariat from the original HELCOM AIS data. The data preparation process could be used for shipping data from other geographic contexts, following the detailed methodology described in the Baltic SCOPE report. This is only possible if an AIS data system, similar to the one maintained by the HELCOM Secretariat, is available. Data processing was funded by the Baltic SCOPE project, funded by EMFF, and Baltic LINES, funded by Interreg VB Baltic Sea Region Programme 2014-2020. Specific costs for this task are not published. Development of the user interface was funded by the EU Strategy for the Baltic Sea Region Horizontal Action "Spatial Planning" Support (HASPS) and the Interreg VB Baltic Sea Region 2014-2020 Programme.